IDology has announced the release of ExpectID® Score – a new real-time, risk-based scoring feature for the ExpectID suite of identity verification solutions. ExpectID Score utilizes Adaptive Scoring that gives organizations the ability to create custom scoring models derived from identity and fraud attributes that can be easily adapted to changes in their business rules. Today’s release marks another major milestone in IDology’s path of continuous innovation by offering this robust scoring platform to their customers. “We wanted to de-mystify the whole scoring process and bring a new level of transparency and utility that will help organizations really understand the underlying factors that create a score and ultimately strengthen their risk models with insights gathered from scoring. We feel users will like the simplicity of the interface, as well. Scoring models can be created on demand, without extensive IT resources giving users complete control over the scoring process,” said John Dancu, CEO of IDology. ExpectID Score gives companies from a wide range of industries the ability to enhance their risk evaluation process by allowing them to add ExpectID Score to ExpectID’s Identity verification solutions. This gives risk managers more options to pass fail or escalate transactions and group identity risk factors into distinct risk categories. 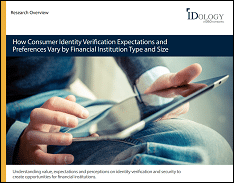 Grouping identity and other fraud indicator attributes into risk categories will also improve organizations’ compliance efforts with regulatory mandates such as Red Flags Rules. “Fraud tactics are constantly evolving, and different industries have fraud challenges that are unique to them. ExpectID Score with Adaptive Scoring will help organizations gain a broader view of the fraud tactics that they experience on a daily basis and be able to adapt to them more quickly,” said John Dancu CEO of IDology. IDology, Inc. provides innovative technology solutions that verify an individual’s identity and/or age for organizations operating in a customer-not-present environment. The IDology platform serves as a collaborative hub for monitoring and stopping fraudulent activity across the entire network while also driving revenue, decreasing costs and meeting compliance regulations. Founded in 2003, IDology offers a solution-driven approach to identity verification and fraud prevention, providing streamlined processes that ultimately help increase customer acquisition and improve the overall customer experience. IDology has developed an on-demand technology platform that allows customers to control the entire proofing process and provides the flexibility to make configuration changes that are deployed automatically – without having to rely on internal IT resources or IDology’s customer service – so customers can stay ahead of the fraud landscape while also maintaining compliance. For more information, visit http://www.IDology.com or call 866-520-1234866-520-1234.